How healthy is consuming Egg - Benefits of egg. Eggs are part of human diet for thousands of years. Most of the proteins are found in Egg white. Best and common way to consume egg is by boiling. All parts of an egg are edibile, including egg shells. The egg yolk contains 1.33 gm of cholesterol per 100 gms and is a rich source of vitamin A, B vitamins, calcium, phosphorous, lecithin and iron. It is a very good source of inexpensive, high quality protein and are Incredibly Nutritious. Vitamin A in egg helps to maintain the skin, immune system and normal vision. Choline, an essential micro-nutrient in egg helps in fat metabolism and liver function. Nutrients with in eggs help to prevent birth defects such as spina bifida. Biotin, a water-soluble B Complex-vitamin also known as vitamin H or coenzyme R improves energy metabolism, maintains skin, hair and the immune system. It help keep your skin, hair, eyes, liver, and nervous system healthy. It contains Folate or Folic acid which is a water-soluble B vitamin that is key for cell growth, metabolism, and for pregnant women. The iron found in the yolk is easily digested and assimilated in the body. Vitamins and minerals in egg improves the conditions of bones and muscles. 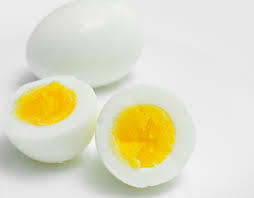 Egg whites are rich sources of selenium, vitamin D, B2 ( riboflavin ), B6, B12 and minerals such as Selenium, zinc, Phosphorus,Iodine, iron and copper. Vitamin A, vitamin B12 and selenium in egg keeps the immune system healthy. It increases the Good cholestrol ( HDL - high Density Lipo Protein ), which decreases the chaces of heart attacks. Egg shells are edibile: they are high on Calcium. Clean the eggshell. Then boil. Let it cool and pound using mortar. Until it becomes powder. You can add 1 tbsp each person to your soup. Or every time you cook. If you have 5 person in family then add 5 tbsp. If you're going to boil eggs wash the egg first so you can pound the eggshell after.